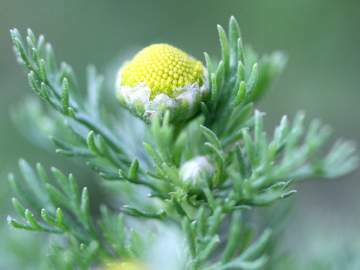 June is the best time to find pineapple weed in bloom, but it can flower all summer. These short plants grow 4-16 inches high and bear small, cone-shaped flower heads that are pineapple-yellow. The flower heads and leaves give off a scent of pineapple when crushed, making the plant fun and memorable for kids. Look for it along the edges of sidewalks and paths. Kids love to explore with their senses – to touch, squish, and smell, as well as to see and hear. And what better source of things to experience with the senses than nature, especially in the summertime? For scratch and sniff, one little plant that’s hard to beat is pineapple weed. Nobody needs to venture into the woods to find pineapple weed (Matricaria discoidea, formerly Matricaria matricarioides). It grows in vacant lots or barnyards and along the edges of sidewalks, driveways, roads, and paths – in places where you’ll find a little bare, packed sandy soil. Ask a kid to look for it in these sorts of places. For example, one promising place to look is the grassy strip between the sidewalk and the road along West Main Street between St. Luke’s Church and the high school driveway. Another place is along the first part of the trail around Lake Chauncy, near the trail entrance on the Westborough State Hospital grounds. The plant is low and green – between 4 to 16 inches high – with finely cut leaves. It blends in with other greenery on the ground, but don’t underestimate a youngster’s sharp eyes. Once kids spot pineapple weed and discover that crushing any part of it releases a surprising sweet scent of pineapple, they won’t forget it. And they’ll have a childhood memory that will last into old age. Not only does the plant smell like pineapple, but it also reminds kids (and grown-ups) of pineapple because of the yellow color of its flower head. The button-like flower head is rather like the yellow center of a daisy but without the petals. It is actually made of lots of tiny, tube-shaped yellow flowers that are tightly packed together – a convenience for visiting insects. 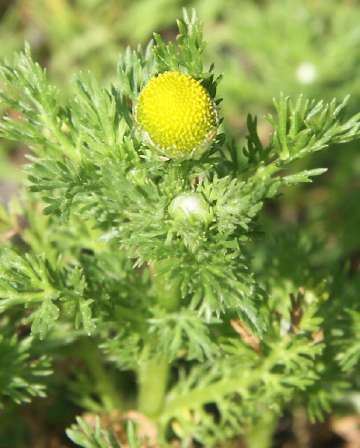 Another name for pineapple weed is “ray-less chamomile,” which refers to its lack of daisy-like petals (called rays) and the fact that it is closely related to the chamomile plant (Matricaria chamomilla). This relative is well known as the source of soothing chamomile tea. Like chamomile, pineapple weed has traditional medicinal uses. These two related plants contain many of the same chemicals, so many of their uses are the same. The tea is reportedly calming and can help lull people to sleep. It has also been used to alleviate digestive problems such as gas and indigestion, as well as menstrual cramps and leg cramps. The tea has served as a wash for skin problems such as eczema and dandruff. It also has been drunk or gargled for oral hygiene. The plant’s leaves have been used in warm, wet packs to kill bacteria on wounds and reduce inflammation. Some Native Americans are said to have used the plant as an insect repellant by crushing it and rubbing it on their skin. No matter what your age, consider adding pineapple weed to your list of fun and interesting things to find in nature this summer.